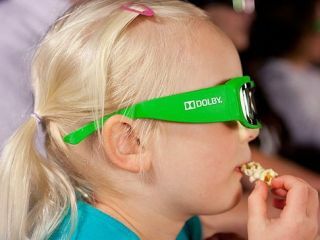 Dolby Laboratories have launched low cost 3D glasses for kids, that should lower the cost of equipment for cinemas. The reusable passive glasses are apparently available for around $12 – that's around £7.50 – and should equate to a substantial saving. The glasses come in 'kid friendly green' and are equipped with sensormatic and RFID tags. "Dolby 3D kids' glasses are high-performance, environmentally friendly, passive glasses that require no batteries or charging," said Matt Cuson, Senior Marketing Director, Cinema, Dolby Laboratories. "Dolby 3D kids' glasses are made to the same premium-quality standards as the adult-size Dolby 3D glasses and will be available to exhibitors around the globe in time for movies coming out in Dolby 3D this summer," he added. The glasses have arrived in time for one of the tentpole 3D films, Cars 2, with the movie world watching to see if a recent reported public apathy to 3D will be reversed. Cars 2 by Pixar is expected to be one of the biggest grossing movies of the year, and after other high profile films such as Pirates of the Caribbean: On Stranger Tides did not perform as expected on 3D screens in the US, the pressure is on.